By Trimble based in Sunnyvale, CALIFORNIA (USA). 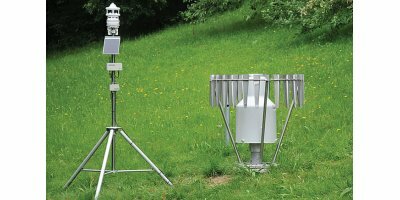 Agro-meteorological application (AgMet) are becoming more and more important. With a rising world population, agricultural production has to become more efficient. Water is precious and scarce, pesticides are expensive and harmful to the environment if they get into the soil. By G. Lufft Mess- und Regeltechnik GmbH based in Fellbach, GERMANY. By PrecisionHawk based in Noblesville, INDIANA (USA). By Advanced Technical Services GmbH (ATS) based in Zug, SWITZERLAND. Laser-induced breakdown spectroscopy (LIBS) offers the ability to analyze soil samples with little sample preparation, provides detection of all elements in the periodic table, and has a large dynamic range (ppm to wt. %). By Applied Spectra, Inc. (ASI) based in Fremont, CALIFORNIA (USA). Using wireless sensor networks within the agricultural industry is increasingly common, as it provides many benefits to the farmer, impacting both the quality of the crops and the overall operating costs. WSN address the traditional monitoring problems related to oudoor areas, by removing the need of cables and of power sources in locations where no infrastructure is available. WSN are also specially suitable for temporary or problem-solving deployments, and to gather more numerous and more consistent data. With Galaxy Scientific's FT-NIR feed analyzer, technicians with no prior knowledge of spectroscopy can quickly and easily load and analyze samples of feed and feed ingredients. With just a mouse click, proximate and other important parameters will be analyzed with one measurement and in less than a minute. By Galaxy Scientific based in NEW HAMPSHIRE (USA). Underground locating and testing for the irrigation industry is our first area of expertise, and it remains our flagship industry. Our wire and valve location and testing tools are geared to provide contractors and workers on the job the robust functionality and simple usability they need at costs low enough to keep profits high. In other words, if you need valve and wire locators that are precise, durable and affordable, look for the Armada Technologies brand. By Armada Technologies, LLC based in Caledonia, MICHIGAN (USA). Maxxam performs Eco-fate testing, drinking water testing, physio-chemical testing and other agrochemical testing for the Agriculture Industry, including. By Maxxam Analytics based in Mississauga, ONTARIO (CANADA). Our lab is certified and equipped to serve our clients by identifying pathogens from samples obtained from soil, water and plants. A variety of tests can be offered for pathogens detection and pathogen identification in the lab. In addition, our scientists, with training in plant protection, will be available to provide consulting services to our clients for additional support. Our timely support can help you to prevent plant diseases from spreading or happening. By Microbe Inotech Laboratories, Inc based in St. Louis, MISSOURI (USA). Introduction The method is used for the determination of the mass fraction of free methionine, threonine, and tryptophan in fodder additives. By Perten Instruments - a PerkinElmer Company based in Hägersten, SWEDEN. TenCate produces and supplies high-grade membranes for the most divers liquid applications. Reliable, tried and tested materials designed to meet today’s needs. Where ever water or other liquids need to be retained, Nicolon membranes offer the simple, most effective solution.